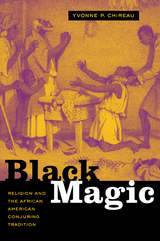 Black Magic looks at the origins, meaning, and uses of Conjure—the African American tradition of healing and harming that evolved from African, European, and American elements—from the slavery period to well into the twentieth century. Illuminating a world that is dimly understood by both scholars and the general public, Yvonne P. Chireau describes Conjure and other related traditions, such as Hoodoo and Rootworking, in a beautifully written, richly detailed history that presents the voices and experiences of African Americans and shows how magic has informed their culture. Focusing on the relationship between Conjure and Christianity, Chireau shows how these seemingly contradictory traditions have worked together in a complex and complementary fashion to provide spiritual empowerment for African Americans, both slave and free, living in white America. As she explores the role of Conjure for African Americans and looks at the transformations of Conjure over time, Chireau also rewrites the dichotomy between magic and religion. With its groundbreaking analysis of an often misunderstood tradition, this book adds an important perspective to our understanding of the myriad dimensions of human spirituality. 1. "Our Religion and Superstition Was All Mixed Up"
2. "Africa Was a Land a' Magic Power Since de Beginnin' a History"
3. "Folks Can Do Yuh Lots of Harm"
4. "Medical Doctors Can't Do You No Good"
5. "We All Believed in Hoodoo"